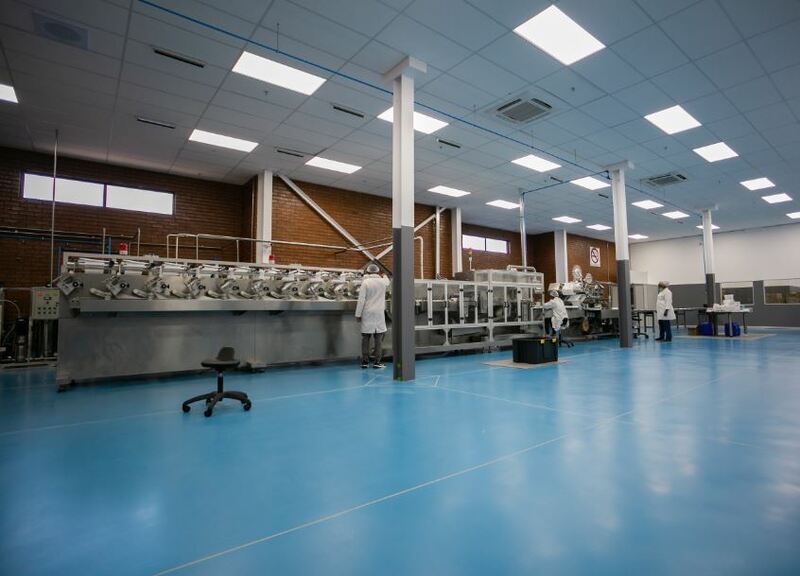 Diaper manufacturer L’il Masters installed 7 000m² of Flowcrete Africa’s antibacterial enhanced, polyurethane system, Flowfresh MF, throughout its new factory in Johannesburg’s Kliprivier Business Park. The company wanted a colourful floor that would be hardwearing, hygienic and contribute to an efficient working environment. Colours aligned with the company’s branding were selected for the five factory zones, where different challenges would be faced depending on location. The 1700m² of Sand Yellow flooring in the main manufacturing area, for example, is exposed to physical impacts, frequent cleaning, large machinery and foot traffic while the 1700m² Signal Green coating in the finished goods warehouse has to withstand point loading from very heavy pallets and the frequent movement of forklift trucks. The maintenance and tools area received 200m² of Signal Grey, the materials warehouse 1700m² of Tomato Red, and 1 700m² of Light Blue was installed in the wet wipe manufacturing, packaging and storage room. As one can imagine, the floors provide a useful navigational tool for staff and visitors by visually linking a specific space with a colour. These floors will not only maintain their bright and vibrant colours in the face of the factory’s intensive industrial operations, the seamless and impervious characteristics of the product will ensure that L’il Masters is able to keep each stage of the manufacturing process clean and sanitary. The site’s cleanability is also improved by the all-natural antibacterial agent that Flowfresh incorporates. Coving was applied along the edge of each room to create a smooth transition between the floor and the wall, stopping any dirt or contaminants being trapped in this hard-to-clean gap. The durability of Flowfresh means that it will maintain its hygienic, functional and aesthetic properties for an extended period of time. If properly maintained, L’il Masters’ new floor should provide its factory in Johannesburg with a high-performance finish for well over a decade. For more information, contact Flowcrete on Tel: +27 (31) 701 0017 or via www.flowcretesa.co.za.